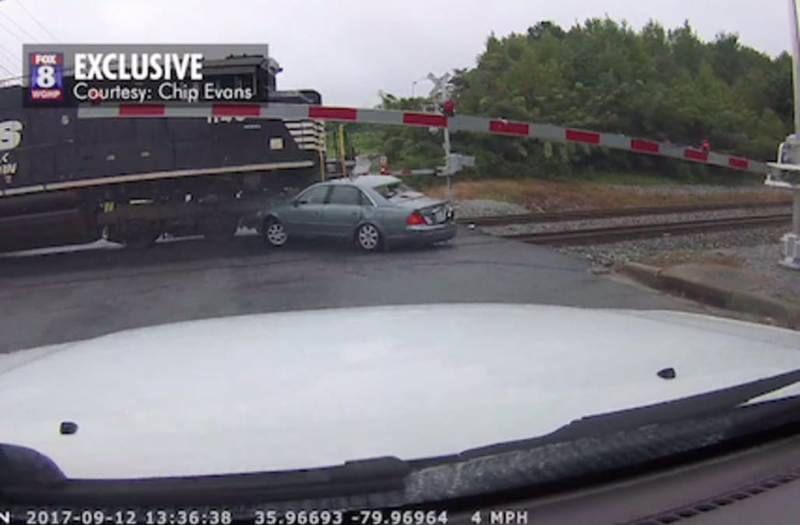 HIGH POINT, N.C. (WGHP) -- A woman narrowly escaped her car before a train smashed into the car in High Point Tuesday afternoon. Video obtained by FOX8 shows the woman in her car stopped on the tracks at Pendleton Road and Martin Luther King Drive in High Point. Chip Evans, Ramos' father-in-law, was about to cross the railroad crossing when the stop arm went down and then went back up. As he was about to cross, the other arm went down and a car proceeded and was trapped. He yelled at the driver, 'Get out of the way!' " Ramos said. She grabbed her purse and ran away just before the train hit her car. “Personnel with the railroad advised there was no damage to the train, engine #1140, or the crossing. A K-9 team responded and performed a search of the area to locate the driver but was unsuccessful,” Cheeks said. Cheeks said because there is property damage and the female driver left the scene, she could be charged with hit-and-run once located. Evans disagrees and believed it is the responsibility of the railroad company. “I would stand in court with her and say that that girl did nothing wrong. Either her car stalled or she panicked that is the only difference between her and myself and it is not her fault,” Evans said. "It’s extremely important to remind motorists never to proceed through a railroad crossing when the lights are flashing. The lights signal that there is oncoming train traffic, and when there are two sets of railroad tracks, it’s important to remember that a second train can be coming from either direction. "In this case the gates and lights activated when a southbound Amtrak train passed through the crossing. When the train finished going through the crossing, the lights continued flashing -- alerting drivers that a second train was coming. The gates then lowered again as a northbound Norfolk Southern train went through the crossing."